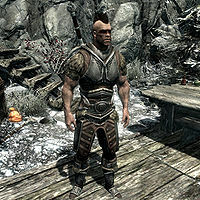 Hajvarr Iron-Hand is a hostile Nord bandit and the leader of a group of bandits in White River Watch. He can be found at White River Outlook, a zone outside the cave, higher up the mountain. He is the nephew of Ulfr the Blind, a fellow bandit. He wears the unique Ironhand Gauntlets, a pair of steel Nordic gauntlets with a fortify two-handed enchantment. His journal can be read to gain insight in his life as a bandit, as well as his thoughts on several recent occurrences. He isn't happy with the way his fellow partners in crime are treating his uncle and has written a note to fellow bandit Rodulf explaining he won't tolerate any more 'jokes' concerning Ulfr. Carriage drivers may comment of Hajvarr's presence: "Got keen eyes? Might see nasty old Hajvarr up on White River Watch. Piece of work. Jarl should just run him out and have done with it." This page was last modified on 7 June 2018, at 17:40.